The typical treatment for sleep apnea, or choking in one’s sleep which usually causes loud snoring, was to go to a sleep center run by a medical facility and stay the night hooked up to probes. The attendants would attach everything, and the patient would then try to fall asleep. The data collected would either confirm sleep apnea or not, and to what severity. Many avoided the test because of its inconvenience as well as the idea of sleeping in a foreign room with someone watching. Fortunately, those days are long gone. 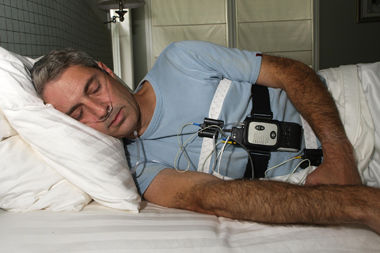 Today’s test for sleep apnea is a simply little operation involving a wrist-strap unit connected to a finger-fitting wire sensor. The patient simply waits until it’s time to go to sleep. He then puts on the wrist unit, inserts his finger into the finger unit, pulls out the plastic film sensor separator and then lets the finger unit inflate until it form fits. The user then turns on the wrist unit to catch the data, and he goes to sleep. The process is amazingly easy to do, and the unit, the Oxymeter Finger Probe, confirms accurately both the presence of apnea as well as how mild or severe it is.